Telkom has been steadily migrating DSL lines to its new ASSIA-based Dynamic Spectrum Management Software. What does this mean for you? A more stable and reliable connection and all you need to do is sit back and enjoy your DSL. The two most important readings on a DSL line is the attenuation (the resistance to the signal) and the Signal-to-Noise Ratio (the signal level compared to the noise level) both of which are measured in decibels. In a perfect world the attenuation should be under 55 dB with a SNR above 6dB. In your ClientZone and Afrihost App you will be able to check the line sync, attenuation and SNR. 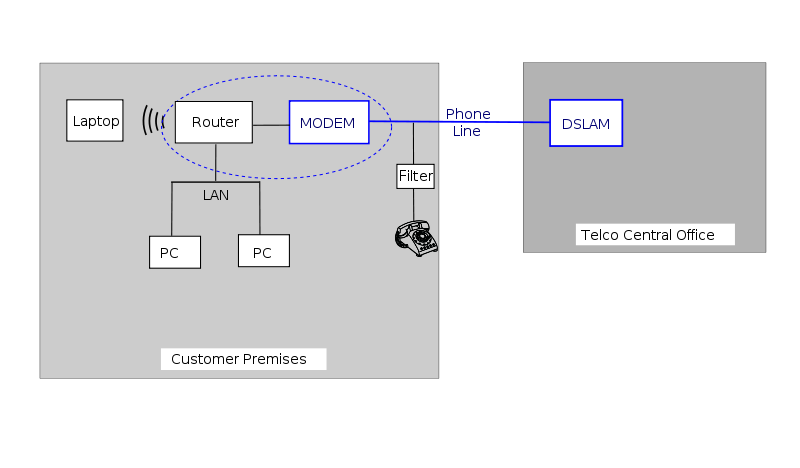 Your line sync is basically the maximum rate that information can be sent to and from your modem. When the attenuation starts spiking above 55 dB and the SNR dips below 6 dB, your line could experience slow speeds. ASSIA will pick up these issues in real-time, and then will make adjustments on your DSL line to improve the quality of the connection. The most noticeable way in which ASSIA will stabilise your line is by temporarily dropping your DSL line sync. Why does ASSIA drop the line sync? How does this actually improve the experience? Copper unlike fibre degrades over time as the copper ages and oxidizes. Added to this copper contracts in cold weather which causes the copper to become brittle and wear out over time. As the copper degrades the attenuation will increase. The distance from your Exchange greatly impacts the maximum line sync you can achieve due to attenuation, the further you are from the Exchange, the higher the attenuation. ASSIA can pick up when the attenuation increases and by dropping the line sync the attenuation can be lessened significantly without actually causing your DSL connection to drop! This means that ASSIA can make sure that your gaming session doesn’t disconnect because of spikes in latency and packet loss or that your Youtube will continue playing without you noticing any buffering happening! If the attenuation and SNR on your line doesn’t improve, ASSIA won’t return your line sync to the original profile. If you are on a 10Mbps line, and the sync has been dropped to 8Mbps for a few days, it may very well be worth considering downgrading your DSL line to 8Mbps. This can only result in an overall improved experience for you. Not all drops in line sync are caused by ASSIA. But how do you tell if ASSIA dropped the line sync temporarily or if there is actually an issue on the line? It’s easy! ASSIA will only ever use one of the 13 line sync profiles that Telkom has available on their system. I’ve listed these profiles below. Your ClientZone and Afrihost App will let you check on your line sync at any time! *This is an intermediate profile that only a Telkom Technician can manually set at present. If you do experience an unusual sync on your DSL line, or you feel your DSL line isn’t quite running as well as it should be, then try out the Fix My Line function on the Afrihost App. Many issues can be resolved with a press of the Fix My Line button. ASSIA is a pretty amazing piece of technology and does a lot of good things in the background to keep your connection running as well as possible. But there are still times when we’ll need to intervene and even get a Telkom Technician to check out your line. Specifically when your line is completely down or your line has become crossed and you overhear a Nigerian Business Meeting while calling your Grandma. 7 Series you should watch!